The Sidhil Easi-Riser Overbed Table is designed to be used over a bed. The light oak laminate surface has mechanical height adjustable and a horizontal top. 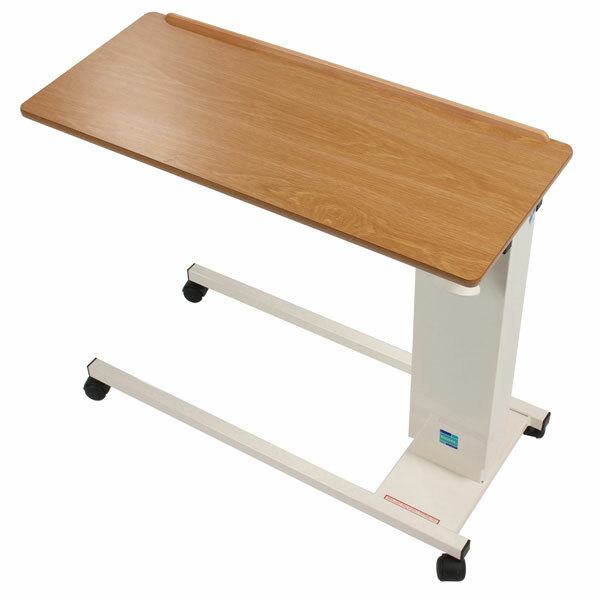 The standard base extends under the bed on swivel castors and is very stable. A anti-trapping safety feature is incorporated in the height adjustment. It is supplied fully assembled. To allow adequate clearance for the table its recommend at least 100mm of under-bed clearance (to account for uneven floors/carpet etc.). Delivery of this product will be made directly from the manufacturer. Delivery lead time is 2 weeks from receipt of order. The product is supplied with comprehensive set-up and user instructions.